Student-friendly versions of the Tennessee and Next Generation Science standards can be seen and read across the room, as demanded by most school administrators. Use these posters to achieve your goal of improving your students’ knowledge of their essential learning. Each statement is accompanied by a fun illustration. 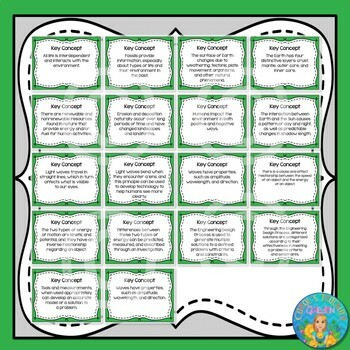 Print full-size for your board, or print multiples to each sheet for use in student notebooks. Both color and black and white versions are included. 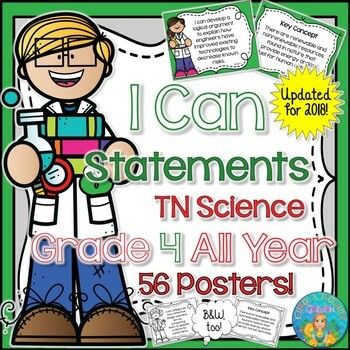 56 I Can Statements and Key Concepts in this pack correlate with the entire year of fourth grade Tennessee Science Standards. They have been completely updated for 2018. Please follow me to receive updates when I post new products, which are 50% off for the first 48 hours. 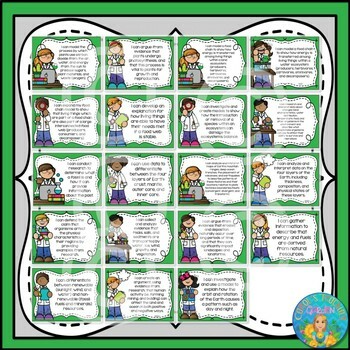 This license entitles one teacher to download the product for personal classroom use only. If you wish to share this product with a colleague, please select additional licenses at 50% off when purchasing, or add later at your “My Products” page. Please do not post this product to the Internet (even to a class web page) as this allows others to take credit for and copy my work. Thank you!